Our family has done it all: home-schooling, zoned school, magnet schools and now, charter schools. I have five daughters, four of whom are still in school. They all attend KIPP Nashville public charter schools. We fell in love with KIPP for what it stands for (literally) and because it is truly a personal approach to education that our family had never experienced before. KIPP stands for “Knowledge Is Power Program” and when my husband and I heard that for the first time, we could not have agreed more. The personal touch started with our very first interaction. I will never forget getting a visit from Nikki Olszewski, KIPP Nashville College Prep’s school leader. She knocked on our door and told us about the middle school she was opening. She listened to us, took the time to get to know Yemurai, who is our oldest daughter and a current sophomore at KIPP Nashville Collegiate High School, and made us feel special. That feeling is even stronger today than it was six years ago. As any parent knows, every child is unique. It’s a joy watching my daughters learn and grow every day and seeing how KIPP is developing, nurturing and supporting them in different ways. My youngest, Azizah, is in second grade at KIPP Nashville College Prep Elementary (KNCPE). She loves socializing and combining learning with her social skills. Thanks to the vision of KNCPE’s school leader, Christa Thomas, Azizah can be herself and feels genuinely seen and appreciated for who she is, right down to her hair. My daughter has black teachers who look like her and know how to pronounce her name. It may seem like a small thing, but in a world where many children feel like they have to disappear to fit into the main stream culture, my seven-year-old has a life inside and outside our home where she feels significant – as significant as any child should feel growing up. My middle daughters, Zenani and Asali, attend KIPP Nashville College Prep. They’re in the same building as Azizah, which in in of itself is special. Asali is in eighth grade, enjoys playing basketball and since her time at KIPP, has developed a strong sense of self-advocacy. Instead of letting me help with her homework, she insists she can just ask her teacher. She does and she’s comfortable doing so. Zenani, my fifth grader, was nervous to leave fourth grade and her friends, who mostly continued on to our zoned middle school. Just a few months in, she’s hit her stride, having found new friends and teachers who nurture her love of reading and math. She won the award for KIPPster of the month recently and came home beaming. That brings me back to Yemurai. She spent her freshman year at a magnet school in Nashville, after deciding she wanted a different experience. This year, she’s back at KIPP. It was a powerful moment for me to bring her to Collegiate High School’s front office and see her get questions answered, and for her to get to make that choice. Because I didn’t have a choice about schools when I grew up. For Yemurai, Collegiate has been a homecoming, of sorts. She’s back with comfortable friends and teachers who give her just enough support that she feels okay stretching herself, while knowing there are loving people behind her ready to help. Right now, she’s excited about working toward applying to Spelman College. For anyone with a teenager, you know it can be difficult to get any information out of them about how their day was or what they’re learning and working on. So when I get text messages and calls from her teachers sharing positive parts of Yemurai’s day, it feels like I’m right there with her in the classroom. At KIPP, there is intentionality in everything teachers and school leaders are doing, from elementary all the way through high school. I know this, because I’m experiencing it across four different students and grade levels every day. Teachers are accessible and provide regular, positive feedback like, “Just wanted to let you know Yemurai had a great question in class today. She’s doing awesome!” And you feel like your feedback is heard and valued, too. Over the years, I’ve watched each of my daughter’s teachers meet my children where they are. The level of cultural competency in the classroom is unlike anything I’ve ever seen and truly gives me peace of mind when I send my kids off to school each day. We love KIPP and feel like we’ve really found a community that serves as an extension of the values we cherish at home. It brings me back to that moment in our living room, face-to-face with Ms. Olszewski, where we made promises to each other about committing to Yeumari’s education and success. 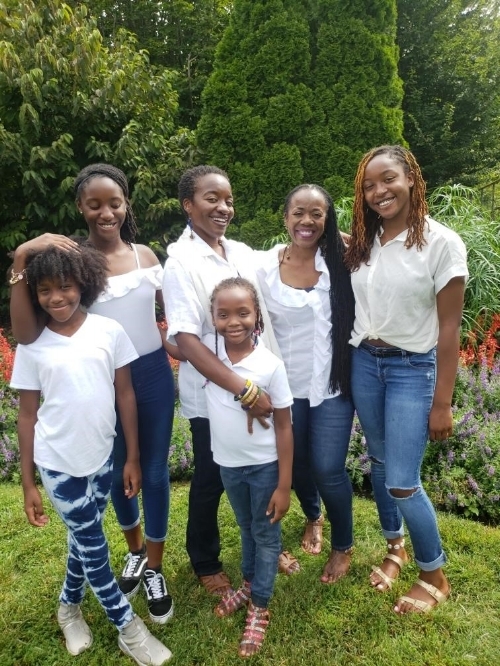 As Yemurai marches toward high school graduation, with three younger sisters watching her every move, and regularly reminding us that it’s “to and through” college, I know our family made the best decision we could have by choosing KIPP.